Innovation platform, The IdeaHub, is once again recruiting robotics and software innovators worldwide to take on the challenge of improving the way we work and interact with the next generation of industrial robots. Working on behalf of ABB Robotics, IdeaHub will help successful applicants pitch their ideas and secure uniquely tailored support packages to maximise their venture’s commercial potential, including funding, mentoring and access to cutting edge hardware. The IdeaHub is a cross sector, open innovation platform that connects visionaries worldwide with funding and support from global corporations. In 2015 they ran their first programme for ABB Robotics, attracting over 130 applicants with 12 finalists selected for a pitch day in London with 6 ventures receiving an offer of support and collaboration. 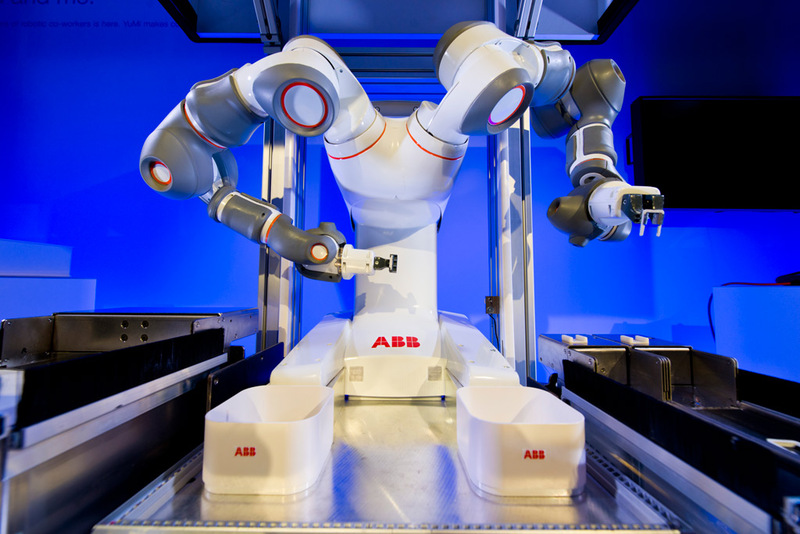 For 2016, they are partnering with ABB Robotics once again to find more solutions to three core challenges to the next generation of industrial robotics. As robots become increasingly ubiquitous in the workplace, the number of people that will work with them is also increasing. Everyone cannot be fully trained roboticists, so for robots to be effective they need to be as easy to work with as a human colleague. This may require natural means of interaction such as speech and gesture or a completely new way for robots to work and interact with their new human colleagues. A large team of robots will also need to be efficient to maintain, so commoditization and simplification of components in another key area of interest for the programme. The usefulness of robots can only extend so far if every action they take has be explicitly given, no matter how natural the interface or eloquent the request for new information. Robots of the future will adapt to new environments and tasks with little interaction. With smart devices in our homes and in our pockets, we are closer than ever to contextually aware and adaptive machine learning but translating this to a fast moving industrial environment raises new and even more exciting challenges. The factory of the future will be intelligent, fully networked and seamlessly connect things, services and people. Mechanical and production engineering will fully integrate with information technology, logistics supply chains and other factories. With such a vast spectrum of devices and requirements, harmonizing the various protocols and interfaces will present huge challenges but also huge rewards for those who can create the most effective solution. Much more information can be found at: www.theideahub.co.uk/challenges. The IdeaHub platform launches today and is open for applications until 30th June 2016. Successful applicants will get the chance to pitch their ideas directly to ABB Robotics at an IdeaHub event in August 2016. There is no limit to number of offers that might be made, which can include funding, access to robots, technology and commercial support as appropriate to the needs of their business. Students, academics, entrepreneurs and businesses who have an idea, concept or technology that can address any of the challenges, in whole or in part, are invited to apply to the IdeaHub for the opportunity to further develop their ideas with ABB Robotics. Last year’s winners included early stage start-ups as well as research projects and offers made ranged from hardware loans to funding and technical collaboration.